Following the Fukushima disaster in Japan early this month, Russian government safety checks of all operating and experimental reactors have triggered skepticism that the experimental floating nuclear reactor vessel, Academician Lomonosov (right image), will be commissioned shortly, then towed to the Sea of Okhotsk, off the Kamchatka peninsula. Prime Minister Vladimir Putin has announced the order for the check of the 31 operational nuclear reactors, which produce about 22 gigawatts, or about 10% of Russia’s currently installed power capacity. But the state nuclear power corporation Rosatom refused this week to respond to Fairplay’s questions about the current status of the Lomonosov. Rosatom launched the vessel last July, claiming it would be completed this year and installed next year at the Vilyuchinsk naval base in Avacha Bay, less than 20 kilometers from the city of Petropavlovsk-Kamchatsky. Rosatom’s project plan calls for another three to five such reactor vessels to supply power to Russia’s remote northern regions. 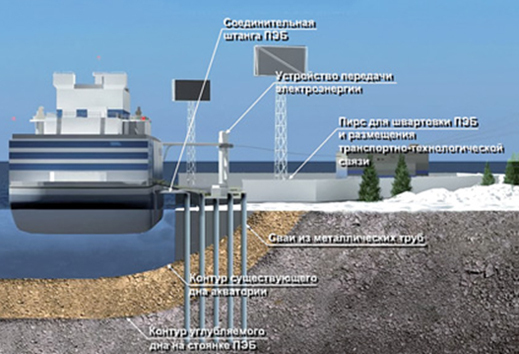 Each of the vessels is designed to have two KLT-40C reactors similar in design to those already powering Russia’s nuclear icebreakers. Installed capacity for each vessel is reported to be 70 megawatts of electricity and 300 MW of thermal energy. Environmental organization Bellona reported in January that the project’s safety is untested, that the technology is outdated, and that no commercial investor is likely for the first or subsequent vessel. Here is the full report. Alexander Nikitin, the co-author of the Bellona report, told Fairplay the Lomonosov will cost at least $550 million. In the January report, he cited concerns about the seaworthiness standards of the vessel. If commercial investors do not materialize, government funding is likely to be cancelled, Nikitin believed – and that was before Fukushima blew up, and started to melt down. This week, Nikitin told Fairplay that implementation of the prime minister’s order is perfunctory while the nuclear industry waits for the Japan crisis to abate. He suspects there has been no change in the plan to sail the Lomonosov to Avacha Bay, though noone is willing to acknowledge this for the time being. “Nothing is being done, no checks, no changes. Everyone at Rosatom is sitting tight,” Nikitin claims. Rosatom head Sergei Kirienko, the Russian prime minister who presided over the August 1998 financial meltdown, said at the launching of the Lomonosov that it is “absolutely safe”. But Kirienko’s spokesman Vladislav Bochkov, along with Olga Galkina, spokesman for the state inspection agency Rostekhnadzor, will not say whether their agencies still think so. 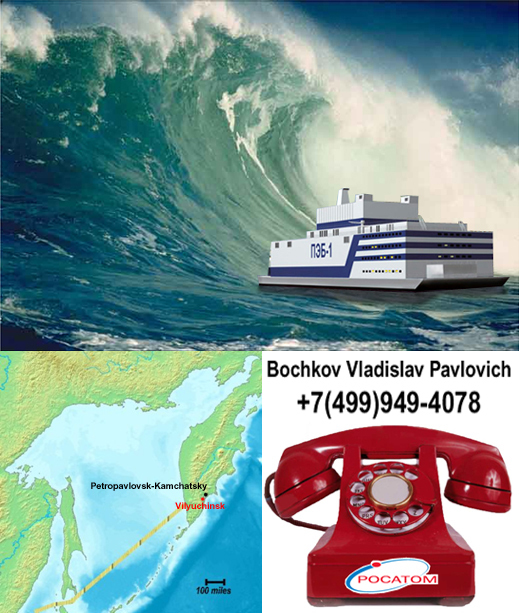 Russian critics argue that if the earthquake and tsunami, which hit northeastern Japan, had struck further north, when the Lomonosov was in operation, the reactor cycle could not have been shut down and the nuclear fallout would have been impossible to contain. Russian records indicate that on November 2, 1952 an earthquake and tsunami occurred in the region at this threat level. A “sea of Hiroshima””, one critic, Alexei Yablokov, has called the Lomonosov risk. The risks of waterborne disaster striking floating nuclear reactors have already been assessed as so great, the US Atlantic programme to install four Westinghouse reactors off the coast of New Jersey, south of New York, was called off after six years of planning in 1978.